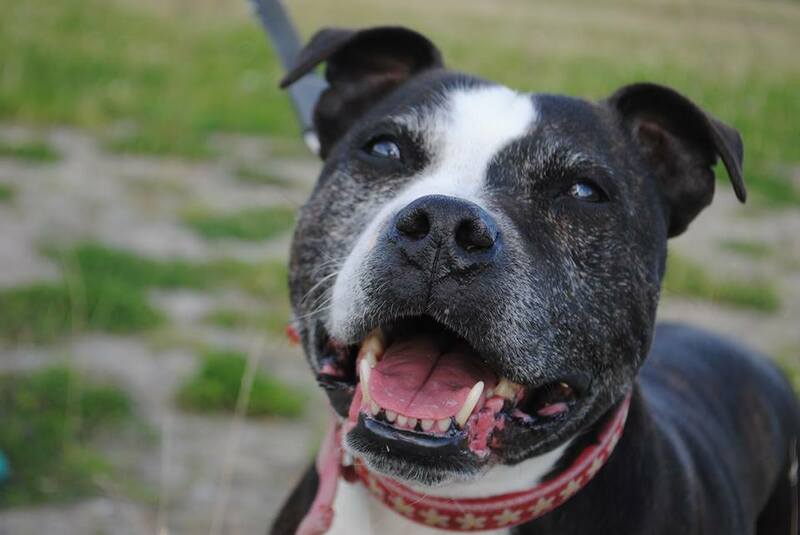 Polly is such a lovely, steady Staffy girl who is approx 6-7 years old. Polly has sadly found herself abandoned in stray kennels, but we stepped in to save her. She has clearly been loved at some point, and is really well behaved. She is feeling quite lost at the moment and can’t understand why she’s stuck in a kennel on her own bless her. She definitely longs to find a new family who will spoil her rotten ASAP as she loves her home comforts. Polly is fully housetrained, and doesn’t chew anything at all in her kennel. She travels well in the car, knows commands and walks perfectly on the lead. What a girl! She is fine around other dogs, isn’t a fan of giddy dogs jumping on her, but is fine as long as they are OK with her. She isn’t a cat fan, though! Polly loves to run around and really enjoys her walks – she can be quite bouncy at times when she’s excited! She would love to find a Staffy loving home where she can be a big part of someone’s family, get plenty of nice walks, and loads of TLC – she really deserves it.